There are several reasons to select an eggless mayonnaise. 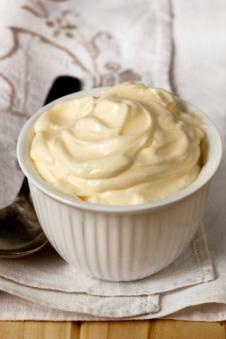 Eggless mayonnaise can be lower in total fat, saturated fat and cholesterol than regular mayonnaise. People who are watching their cholesterol intake may consider eggless mayonnaise a good dietary substitution. Vegans can use this version on sandwiches, in recipes or as a salad dressing. This product is also a great alternative for people who have egg allergies. Making your own eggless mayonnaise allows you to control your end product; the cook can control salt and fat levels and can add additional flavors to the mayonnaise. The ingredients can be mixed in a blender, with a mixer or with a hand whisk. These versions must all be stored in the refrigerator after making. Here are some basic eggless recipes using milk, soy milk and tofu. Mix all ingredients together slowly with a whisk. Place soy milk in a food processor and blend on low. Gradually add the oil into soy milk and add other ingredients. Combine ingredients together and blend until mixture is smooth. Mayonnaise technically always contains eggs; the eggs add texture to the dressing. For an eggless mayonnaise, the cook has to substitute something to retain the feel and creaminess of regular mayonnaise. Some recipes substitute whole or condensed milk for the eggs. For vegans, substituting soy milk or tofu can maintain that creamy texture. Cooks are always experimenting to find other ingredients to use to keep the consistency of mayonnaise. The cholesterol and fat content in the eggless version depends on what is used in place of the eggs. Using whole milk does not lower the fat level as much as using soy milk or tofu might. Another advantage to making your own mayonnaise is that you can experiment with different flavors. Adding lemon juice or dry mustard powder may add a bit of tanginess to the recipe. Adding chopped herbs like basil, oregano, sage, dill or parsley to the standard recipe can create a tasty alternative for a vegetable dip or create a different flavor combination when spread on a sandwich. If you don't have time to make your own eggless recipe, you can buy one of a multitude of versions from grocery stores like Whole Foods or Trader Joe's or from online websites. Several of the products sold in stores are made with soy protein and are okay for vegans to eat. Vegenaise® - This popular brand calls itself a mayonnaise alternative. It uses soy protein and is appropriate for vegans and people with egg allergies. It is low in sodium, gluten-free and has no trans fats. Spectrum Light Canola Mayo - This is another soy mayonnaise product with 1/3 the fat of regular mayonnaise. This is a vegan product and is gluten-free as well. Hampton Creek Just Mayo - Hampton Creek's vegan mayo is particularly creamy and rich. Eggless mayonnaise is a tasty and healthful way to incorporate a lower fat staple into a diet; with a few alterations, this mayonnaise can be enjoyed by vegans as well.